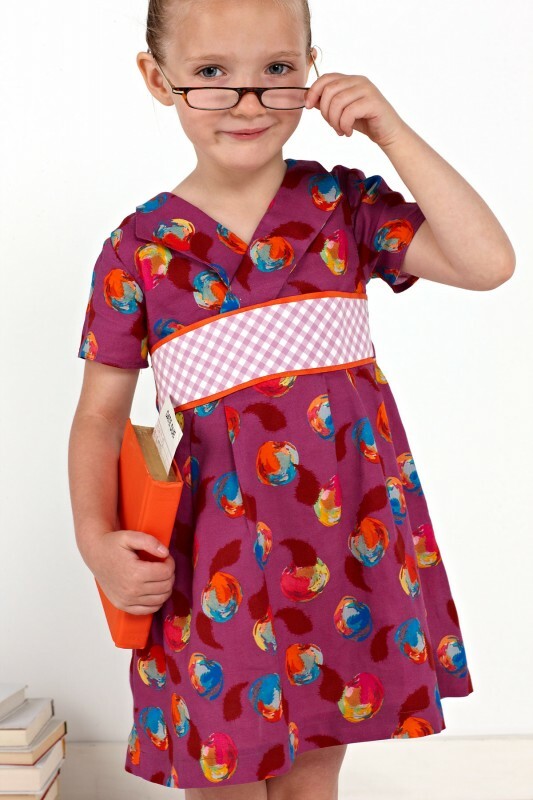 Today I’m happy to introduce the second of our three new styles for Fall 2013: the Library Dress. I think this dress fits into our collection just perfectly. It’s slightly tailored but still so sweet and feminine, and it offers lots of options for customizing and getting different looks. Since there are two views, you can combine elements from each view to achieve quite a few styles from a single pattern. This dress originated with a photo that my friend Brooke sent me, along with a pleading email. 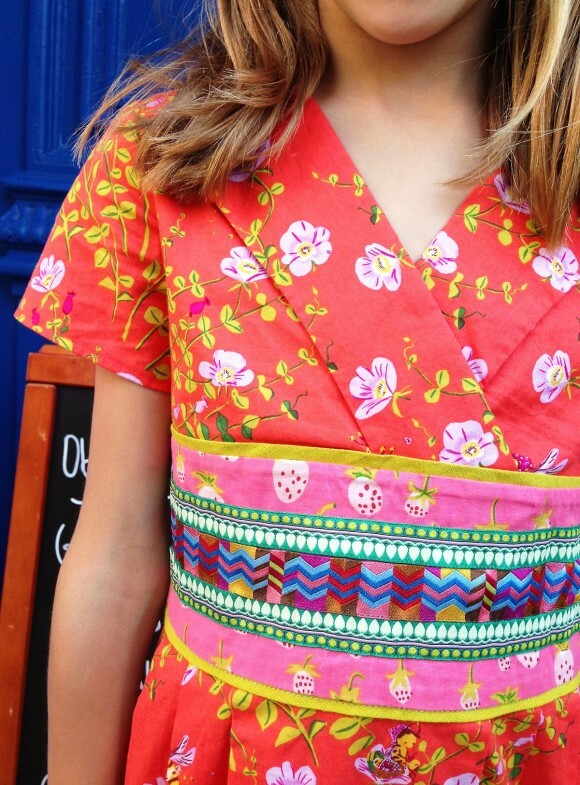 Her youngest daughter had just outgrown their favorite vintage dress! It was such a cute dress, I could see why they liked it so much. This is our version of that beloved dress; similar in feel, but different from the original in many of the details. I love the collar on View A, which looks like it just folds back from the bodice. It doesn’t, actually but it’s very easy to sew. In addition to View A, with short sleeves and the cute collar, we added a View B, without the collar and with 3/4-length sleeves instead, for a completely different look. I love the notched cuffs on the longer sleeves. They’re such a great detail, aren’t they? The pleats in the skirt keep the dress on the tailored side of things, but you could always gather the skirt if you want to make it more sweet and feminine. And the combination of the mock-wrap bodice with the pleats makes the dress almost look like a wrap dress. I can see why the vintage version of this dress was such a favorite in Brooke’s house. I hope it will become a favorite in your, too! You’ll be able to purchase the dress here on our website in just a few days. I am sooo looking forward to this dress. So cute!…have three Granddaughters..would lovethisDress!…Do you sell Patterns? Yes, this pattern will be available on our website later this week. So beautiful, I can’t wait to make it. Oh, I am looking forward to this one! It looks like it might work in knit fabric as well? I can’t wait to work on ideas for that waistband! This dress looks great. I wish one of the samples was in a solid color. I think the details would stand out better. So beautiful! Will the dress be available as a digital pattern as well as soon as it is published? This dress is stunning! I love the options available and the collar is very clever. Brooke thank you for pleading. This is a must have. I am DEFINITELY having this pattern! Wow, I love this dress! I want one for me! This collection is just perfect and I would love both patterns. Can’t wait to see what else is coming! OMG. A Killer. A must have dress. Sigh…. This is wonderful! I am partial to the version with no collar and 3/4 sleeves. I love that you’re offering two different sleeve versions. Sometimes it’s hard to find nice dresses with longer sleeves. This will be perfect for my little girl’s October birthday. I love, love this dress, and the cover sample. Maggie, there is a solid posted in the Flickr group. I think the details in the dress are so pretty. I am excited about this dress, its just lovely. What a fun dress! I know my little girl will love it! Gorgeous! I love that first one, I can see many possibilities in mixing fabrics (solids + prints) and details. Love this dress! I’m curious about the waistband. Is it inset or does it attach like a belt over the dress? I love it!!!! !This is so lovely. I can’t wait to make this one. Thank you!!!!!! My favourite O+S pattern ever. I love it – especially the two sleeve options. We have Japanese day coming up at school in October and I’m definitely making this in Rashida Coleman Hale’s Tsuru or Koi prints for my daughters. So, pleading emails actually work??? This is just beautiful; I know my daughter will love it! It’s a good mix of feminine, yet tailored. Meaning, my daughter will like it (the feminine part) and I’ll like it (the tailored part)! Wow! Just wow! This dress is so totally my style, I cannot wait to get my hands on it. Thank goodness I’m rather behind on school sewing for my two girls. If it is at all possible to pick a favorite O&S dress pattern this one is at the top of the list. 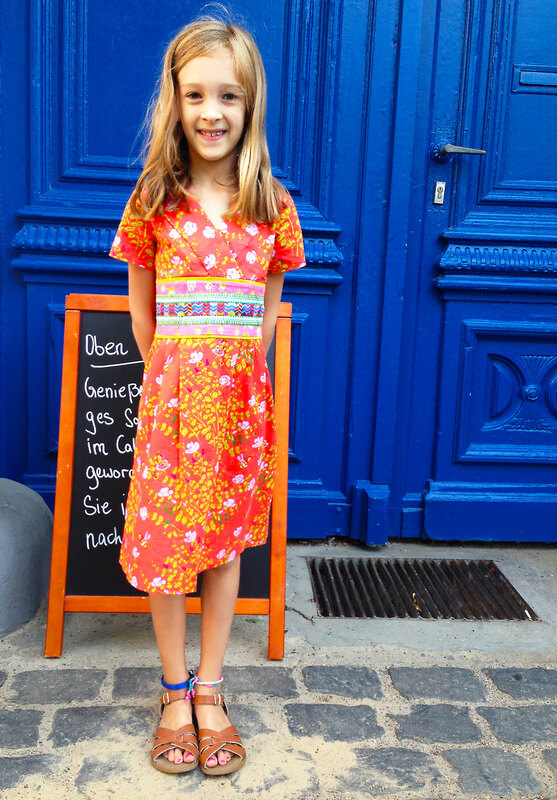 Thanks so much, Leisl, for creating such gorgeous and top-notch patterns! LOVE, LOVE, LOVE IT!! Seriously….everything about it! Beautifully tailored, and feminine…but with so many options to ‘mix it up a bit’. I love the dress and the little peek of German on the chalkboard behind your S in the last two photos. Ein schönes Kleid für ein schönes Mädchen! WOW! I love your patterns so much! Im the proud owner of 5 so far! I recently made my first one, and Its was such a great pattern!!! I love these patterns! I cant rave about them enough….although I think i did a fair job of it on my blog!! thanks liesl! !